Mumbai: Reserve Bank of India (RBI) governor D. Subbarao has justified the central bank’s hawkish monetary stance, arguing that India’s high inflation is not only driven by supply bottlenecks but also domestic demand pressures and that the current rate of price rise is “unambiguously inimical" to growth. “The argument...of our critics that monetary policy has no role because inflation is a result of imported commodity prices would have been valid if the increase in commodity prices was a pure and transient supply shock or if there were no demand pressures. That clearly was not the case in India," Subbarao said, according to a text of the speech posted on the central bank’s website. He also reiterated that RBI is willing to sacrifice some of the short-term growth to protect medium-term growth. Subbarao argued that if inflation is above 4-6% level in India, growth inevitably gets sacrificed. At the present level of 9%, India is way past that threshold level. “At this high level, inflation is unambiguously inimical to growth; it saps investor confidence and erodes medium- term growth prospects," Subbarao said, adding that RBI’s stance is “geared towards safeguarding medium-term growth even if it means some sacrifice in near-term growth." RBI on 16 September extended its record interest rate increases to tame the fastest inflation among the so-called Bric (Brazil, Russia, India and China) economies. India’s benchmark wholesale price inflation accelerated to a 13-month high of 9.78% in August, and higher food and fuel costs and weakness in the rupee may further boost prices. The central bank has raised its key policy rate 12 times starting mid-March 2010, from 3.25% to 8.25%, the fastest round of increases since RBI was established in 1935, Bloomberg data show. It has done mostly through baby steps or a quarter percentage point hike at a time. Subbarao said the baby steps were necessary to allow time for the banks and the private sector to adjust to a higher interest rate environment. 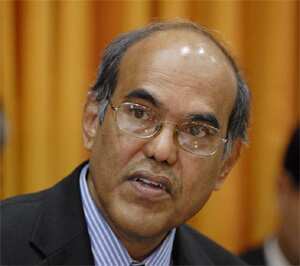 “Our baby-step approach during 2010 was accordingly a delicate balancing act between supporting recovery at home amidst growing global uncertainty and containing inflation pressures," Subbarao said, countering any argument that RBI should have been more aggressive in its rate hikes initially, instead of hiking rates sharply—like the half a percentage point hike in the first quarter policy—and miss the bus on inflation management. India’s stance contrasts with other Asian nations from South Korea to Malaysia, which kept borrowing costs unchanged this month as Europe’s debt crisis and a faltering US recovery cloud the outlook for expansion. India’s benchmark wholesale price inflation of 9.78% in August compares with consumer price gains of 7.2% in Brazil, 8.2% in Russia, 6.2% in China and 5.3% in South Africa last month from a year earlier. Subbarao said the monetary policy stance of the central bank is aimed at restraining demand and anchoring inflation expectations. “Given the nature of the inflation drivers and their combined impact, clearly there is a significant role for monetary policy in combating inflation," Subbarao said, indicating that the central bank still sticks to its stated objective of reversing its stance of rate hikes only when inflation comes under control. Analysts tracking RBI are divided on what will the central bank do when it announces its monetary policy for the second quarter on 25 October. While most of them expect that there can be one more quarter of a percentage point hike in policy rates before RBI pauses, some expect that it has already reached the peak and RBI may opt for a pause. RBI had made it clear previously that it will not change its stance unless inflation is under control as that would be “premature" to do. Most expect inflation to continue to remain high at least till November, and, even after that, it may not come down sharply.